This film is essentially a reworking of episodes 5 and 6 of the original Patlabor OVA series. It is of course much more complex and more political. In an interview Masami Yuuki claims that Mamoru Oshii made this film to showcase his favourite character Shinobu Nagamo. Oshii apparently got the job as director for "Ghost in the Shell" based upon his work on this film. Apart from the bird motif of the film, Oshii's favourite animal, a Basset Hound, makes it's debut in one of his anime films (a cardboard cut out appeared in his 1992 live action film "Talking Head") and would later become one of his trademarks. The dog would later appear in "Ghost in the Shell", "Minipato", "Avalon" and "Innocence". In 1998, Oshii re-released the film with a Dolby Digital 5.1 channel remix. Additional music was also added by Kenji Kawai. 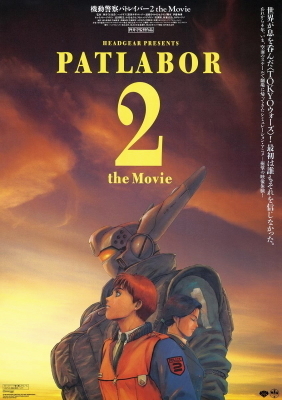 The remastered version of this film, and "Patlabor the movie", were released on the home video in Japan in December 1998. Maiden Japan released the film in the US on Blu-ray and DVD with an English dub, original Japanese dialogue and English subtitles, but no extras. In Japan the movie is available on Blu-ray with an English dub and English subtitles from Bandai Visual/Emotion. Panorama released the film in Hong Kong on Blu-ray and DVD with the Japanese dialogue, English subtitles as well as well as an optional Cantonese dub and Chinese subtitles but no extras. The Maiden Japan DVDs and Blu-rays are only available in the US, and therefore will only work on DVD/Blu-ray players that are both NTSC compatible and will play region 1 DVD discs and region A Blu-ray discs. The Bandai Visual/Emotion DVDs and Blu-ray discs are only available in Japan and will only work on NTSC compatible and region 2 compatible DVD players and region A Blu-ray players. The Panorama DVD and Blu-ray are only available in Hong Kong, and therefore will only work on NTSC compatible and region 3 compatible DVD players and region A Blu-ray players. If you don't live in these countries, check your player's instruction manual to see if it will play the discs. Please see the English Language Movie Releases Video List for a complete listing of all releases, formats and product specifications for this movie in English. This movie is available in Japan from Bandai Visual/Emotion on DVD and Blu-ray. The DVD version does not come with English subtitles or an English dub, however the disc Blu-ray release has the new English dub and English subtitles. Please note all versions listed below only contain the 1998 Dolby Digital 5.1 remix and not the original 1993 theatrical audio. These discs are only available in Japan, and therefore will only work on DVD, Blu-ray, and UMD players that are both NTSC compatible and will play region 2 DVD discs and region A Blu-ray discs (if you don't live in Japan, check your player's instruction manual to see if it will play the discs). Please see the Japanese Movie Releases Video List for a complete listing of all releases, formats and product specifications for this movie. A GWEI Product. ©2003 - 2018 GWEI. Patlabor 2 the movie ©1993 Headgear/Emotion/TFC. All other logos/trademarks are copyright of their respective owners/companies. Used for review and illustration purposes only.